After getting my heating and power usage/generation in to EmonCMS I wanted to start pulling other sources of data into EmonCMS to I started looking for a more expandable method to bring multiple sources of data in to EmonCMS. Open Energy Monitor, the folks behind EmonCMS, have recently started looking at Node-RED so I decided to also have a look at this. It is also getting colder I wanted to get a bit more information on the operation of my OpenTRV board that has been sitting underused since the spring when I installed it on the radiator in the office. I won't go in to detail about downloading/installing Node-RED as there are good instructions in the Node-RED documentation and the Node-RED EmonCMS Node blog post includes instructions on installing the EmonCMS specific components. First of all we need to get the data from the OpenTRV devices. In my setup this is via a USB to TTL adapter connected to the serial data port on the OpenTRV. On the right hand side of the window you can now select the Debug tab and you should start seeing the OpenTRV console output appearing after some time (can be up to 5 mins with the default OpenTRV settings). Now we can start processing the data. As a first step we can do a quick clean up and get rid of any white space, particularly the return/line feed characters removed. 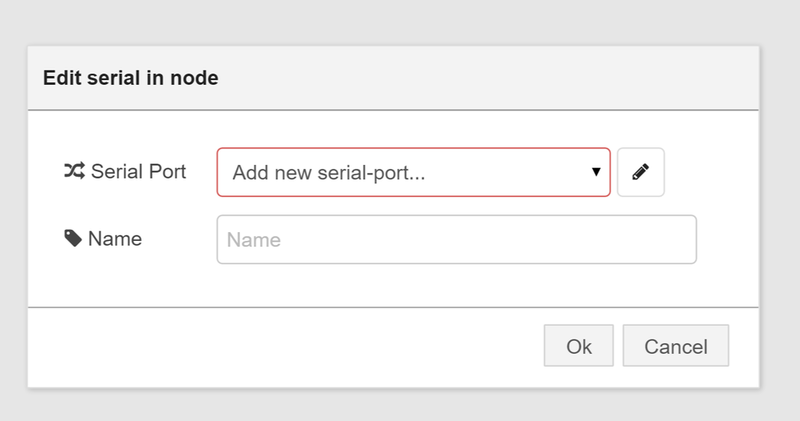 Deploy and now we will see white space on the message output from the serial and if all goes well the debug of the function node output will not have the white space removed. One thing to note here is if you hover over the output in the debug tab, the corresponding node that generated that entry will be highlighted. In the above case the mouse is over the debug from the function output and corresponding debug node is highlighted. Let's move on and look at a simple log file of one OpenTRV TRV controller directly connected as described above. There are three different types of output messages that we are getting. An empty line, a '>' and a line starting with '='. The empty lines we can ignore. The '>' is telling us that the OpenTRV is ready to receive commands. This will be of interest to us later but right now it is the line starting with '='. This is the line that contains the status of the OpenTRV board. So let's sort out these lines. For this we use the Switch node. This node takes an input and based on some criteria outputs it on one of the node outputs. So what is this doing? For the first output we are detecting the empty line case, this is done with 'matches regex'. With out going in to a lot of detail on regex (Regular Expressions) these allow you to do complex pattern matching and are very useful for processing text. In this specific case the regex ^ matches the start of the string and $ matches the end of the string and as there are no chars between the two chars this will match one match an empty string. The second output is a bit simpler. This just checks for a direct comparison (==) to > to detect the case when we can send commands to the OpenTRV. The third output is using a regex again. This time we are using ^ to match the start of the string then = to match the = char. So this will detect lines starting with = at the start of (and only at the start of) the line. This is important as the = char may occur in other parts of the string and we do not want to match those cases. Finally the last output just catches everything else that falls through. We could do away with the first two cases and just let them fall through to here but actually adding code in to detect those cases allows us to check for errors and/or additional output we may have missed. For now lets disable all the debug nodes other than the one connected to the third output of the switch, the one outputting lines starting with '='. We now have an output that is just the line that is the device status, we just need to parse it. There is no in built node that can parse the status text so we have to do it ourselves. Again we shall use the function node for this. Drag one on to the workspace and connect to the third switch output. Double click and lets write the code to parse the status line. Ignoring the regex for now this bit of code is fairly self explanatory, call the msg.payload.match method and if it returns null (no matches) raise an error and exit without generating and additional messages. Scary right? but lets break it down. This next bit looks for the mode which can be F (Frost), W (Warm) or B (Bake). So with this in mind it becomes a little clearer what is going on the | character matches the text on the left or the right. The other important bit here is the ( ), these encompass an sub-expression and allow us to refer to the matched string later. We all be using this a lot. Next we have the valve position. again we have the the parentheses marking the part of the string we are interested in. The [ ] operator matches any single character contained with in them and the 0-9 is short hand for any char from 0 to 9. The + matches one or more of the preceding character and finally the % just matches a % character. So this will match a sequence of one or more numbers followed by a %, but importantly only the numbers are matched for later use. This next bit, the temperature, is basically the same as the valve, a literal match of @, a sequence of numbers, the C character followed by a hex number (0 to 9 or A to F). This section is reading the first of the optional sections.This section at first looks similar to all the rest, ;X followed by a number, but that expression is surrounded by ( )? . The parentheses have the same function as before but we are also using the ? operator. This matches zero or one of the previous match and in this case that is the content of the parenthesis. The set of characters is the time/program section. Again basically the same as previous sections with two exceptions. First there are multiple expression we are matching and second is the ([^;]*). This expression uses a * instead of a +. The * matches zero or more of the previous expression rather then the + that matches one or more. Second lets look at the content of the [ ]. At first you may think that this is looking for ^ or ; but the ^ character changes the meaning of the [ ] to be none of the contained characters, so this expression is matching zero or more characters that are not a ;. These next two sections are basically the same as the previous sections, the first matches the target temperatures and the second matches the house code. The penultimate bit is just a catch all for anything we don't understand before the last section. This method returns an array containing the matched text and any parenthesised parts of the expression, I.E. parts will be the full text that is matched, part will be the first parenthesised sub-expression, parts the second, etc. We now have our string parsed and all the interesting parts stored in the parts array for us to use. So lets do that. First lets deal with the bits that are always included. Here we are starting to build our message with the parsed data. The mode is stored in part and this is used to create three properties frost, warm and bake which will have a value 1 or 0 based on the mode. This may seam a little odd but this is a bit of forward planning as EmonCMS only accepts number values and separating it into these values will allow us to show indicators in an EmonCMS dashboard. The valve position, stored in parts is a simple one, we just assign that to the valve property. Finally the temperature is stored in part and part is a little more complicated, part is the whole degrees while part contains a hex number representing the 1/16th of a degree. We use the parseInt function to convert the string to an integer to allow us to do the needed maths to combine the two parts and end up a floating point number of the temperature. This is assigned to the temp property. If a particular parenthesised sub-expression is not matched (or rather has zero instances because of the ?) then it will have the value null in the parts array so here we are testing for a non-null value but not doing anything with the data, we can fill that bit in later if/when we need to. Next we get to the target temperatures these are useful to know so we can see the temperature we are trying to get to. We store these as properties of the payload of your new message for use by the next node. Next is the house code, this we can just put in a place holder for later use. In general we want all the data in the JSON block to be placed in the payload of the new message. Also as we are not tight on memory, expand the names in to something that is a bit more human readable. This is what is happening in the default section of the switch statement. We do however have a few special cases. The first is the '@', this is the ID of the node so we do not really want that in the payload. Instead we place as a property of the message directly. The other one that requires special handling is the current temperature. This is in 1/16 of a degree C to help reduce the size of the message sent over the radio. Again as the are not so worried about size we convert this to degrees C which is a bit more useful when it comes to analysing the data later. Finally we can return our new message for processing by the next node. So there we have it data being read from an OpenTRV node and feed in to EmonCMS with relative ease thanks to Node-RED.